PGC 6240 is an elliptical galaxy about 350 million light years away in the southern constellation of Hydrus. It is surrounded by globular clusters that unexpectedly contain both young and old stars — thought to be a result of a galactic merger in the recent past. Astronomers are studying a wispy rose-shaped galaxy some 350 million light years away, looking for clues to the violent galactic collision that likely created this celestial bloom. 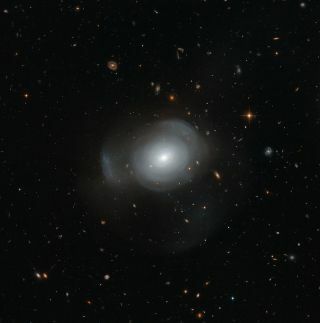 The Hubble Space Telescope captured detailed images of the galaxy dubbed PGC 6240, with its hazy petal-like shells that become increasingly sparse as they get further away from the galaxy's bright center. Scientists described the formation as a "pale rose in the sky" as they unveiled the new Hubble images and video of galaxy PGGC 6240. The object's strange structure and its young stellar neighbors suggest it was born out of a recent galactic merger, astronomers say. PGC 6240, which sits in the snake-shaped southern constellation of Hydrus, is surrounded by globular clusters of stars. Typically, these densely packed galactic groupies would be the about same age, but not the ones around PGC 6240. Its clusters are varied, with some old stars and some unexpected young stars. The most likely explanation for these relatively new stars and the concentric shell structure is a smashup of two galaxies. "Such a merger would send ripples through the galaxy and disrupt its structure, forming the concentric shells of material seen here," European Space Agency officials explained in a statement. "It would also ignite a strong burst of star formation in the galaxy, which would then trigger similar activity in nearby space — leading to the creation of new, younger globular clusters around PGC 6240." The Hubble Space Telescope is a joint project between NASA and the European Space Agency. It launched in 1990 and orbits Earth every 97 minutes from an average altitude of 353 miles (569 km) in order to peer deep into the universe.